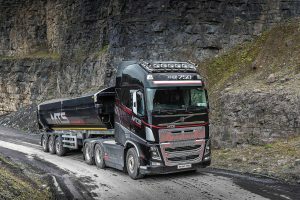 With the majority of Westport-based MTS Haulage’s aggregate tipper work and specialist heavy haulage work being in the West of Ireland, it has added a high specification Volvo FH16.750 6×4 tractor unit to its fleet. The combination of Volvo’s Adaptive and Eco Cruise Control and Dynamic Steering, in addition to front and rear air suspension, means the vehicle offers an exceptionally smooth ride despite the challenging road conditions. The inclusion of an I-Shift Crawler gearbox in conjunction with the Tandem Axle Lift are, in McDermott’s opinion, essential for his type of work. The Tandem Axle Lift feature allows drivers to vary effortlessly between heavy haulage and tipper work. Added to this, Volvo’s I-See technology really comes into its own in Ireland’s unpredictable landscape; learning the roads and therefore smoothing uphill climbs and most importantly, saving vital fuel. Along with a custom cab fit-out by Royal Class Truck Interiors of Alphen aan den Rijn in the Netherlands, the superbly presented FH16 sports a specially-commissioned paint job by RJM Spray Painting in Claremorris, County Mayo, which is finished off with Alcoa Dura Bright alloys, Kelsa roof bars and spotlights. MTS Haulage, located in Knockranny near Westport, also opted for heated and ventilated leather seats, an audio package with Bluetooth, microwave oven and an electrically-moving lower bunk. Additional practical and safety features include tyre pressure monitoring system, load indicator and reversing monitor with camera.